These luscious bars are thick, cakey, and delicious! If there’s no Greek yogurt handy, sour cream makes for a good substitute. Preheat the oven at 350-degrees. Line a 13X9 baking with aluminum foil and apply nonstick spray or butter. In a big bowl, cream together the butter and sugars until light and fluffy. Add the eggs, one at a time, scraping the bowl as necessary. Add the vanilla extract and vanilla yogurt next, followed by the flour, cinnamon, and baking powder. 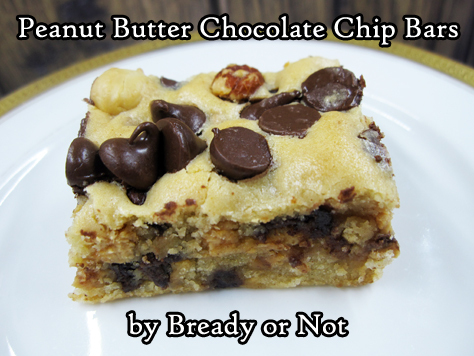 Fold in the peanut butter chips and 1 cup of the chocolate chips. Scoop the batter into the prepared pan. Sprinkle the remaining chocolate chips and the peanuts over the top and gently press them in. Bake pan for 30 minutes or until the center passes the toothpick test. Let cool completely. Use foil to lift contents onto a cutting board to slice into bars. Store in a sealed container at room temperature or in the fridge. Freeze bars between waxed paper in a sealed container to make them last even longer.